Social media is amazing, isn't it??? I remember back when "meeting someone on the internet" was considered crazy. Someone I worked with back in Virginia about 12 years ago met her husband online but had to tell her family they met at a bar, because at the time they were afraid people would think poorly of them. If you ended up meeting someone you met online, it was considered sketchy. However... I will tell you that my roommate in college and I met through a Craigslist ad back in 2001 and she's been stuck with me ever since. I actually met Sarah online and was Facebook buddies with her for almost 2 years before we met in person... even though she literally lived 10 minutes down the street from me. Go figure. We were both part of an online networking group and clicked over text super quick. She helped me, I loved her craftiness and caring spirit, and it spiraled into awesomeness from there. But we're not here to talk about us. We're here to talk about Sarah and Patrick! Around the end of October 2017, Sarah and Patrick went on a road trip to Tennessee. After leaving Knoxville, they decided to head towards Asheville on the way home. After a long drive on the back roads, Patrick randomly turned and took Sarah 2.8 miles down a one lane dirt road somewhere in Pisgah National Forest. They hiked deep into the woods and down the most terrifying, rickety staircase, to the base of a beautiful waterfall. There wasn't a soul in sight. After some pictures and gazing in awe at the foliage, Patrick suddenly dropped to one knee in front of Courthouse Falls at 11:11am and asked Sarah to spend forever with him. Y'all, I am SO EXCITED for their wedding! With both of them being Irish in heritage, they could think of no better day to get married than March 17th... St. Patrick's Day!!! Which, in case you didn't know, is also my birthday!!! I don't work on my birthday for just anyone, so you HAVE to know that this couple is special! With a gorgeous venue at The Barn at Valhalla in Chapel Hill and whimsical woodland details, this wedding is going to be AMAZING!!!! I cannot WAIT! 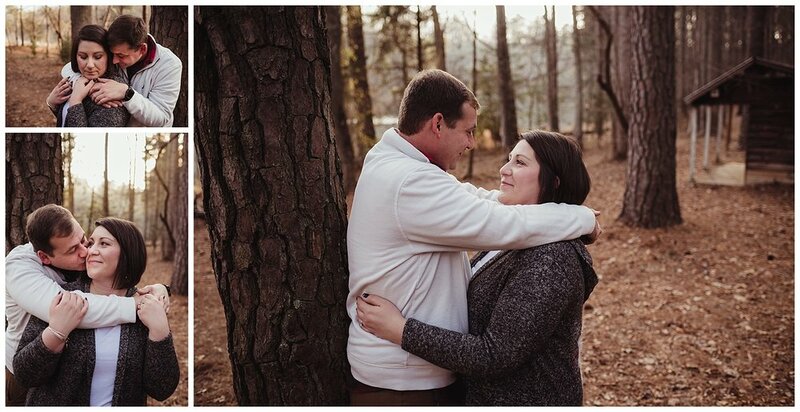 But for now, just gawk in their awesomeness as we took their woodland engagement pictures over at Durant Nature Preserve in Raleigh. Enjoy, and send the couple some awesome vibes!! !